The Java pow Function is one of the Java Math Library function and it is used to calculate the Power of the specified expression. In this article we will show you, How to write Math.pow function in Java Programming language with example. Base: Please specify the base value here. Exponent: Please specify the Exponent value or power here. The Java Math.pow function will return the Base value raised to the power of Exponent value. 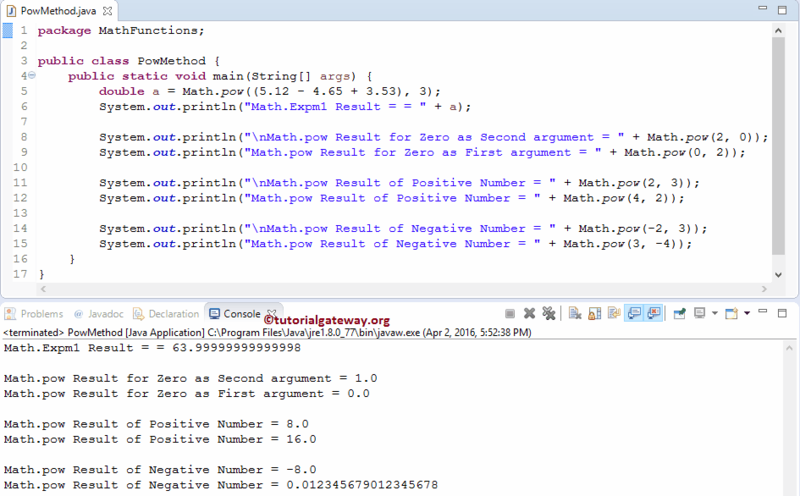 If the Exponent value is positive or negative zero, Math.pow in Java will return the result as 1.0. If either the Base value or Exponent value argument is not a Number, Java Math.pow will return the result as NaN. When the Absolute value of the Base value is equal to one and the Exponent value is infinity, then Math.pow in Java returns the result as NaN. Absolute value of the Base value is less than one and the Exponent value is negative infinity, then the result is Positive Infinity. Absolute value of the Base value is less than 1 and the Exponent value is positive infinity, then the result is Positive Zero. the Base value is positive infinity & Exponent value is less than zero, then the result is Positive Zero. Base value is positive infinity & Exponent value is greater than zero, then the result is Positive Infinity. Base value is negative infinity and the Exponent value is less than zero but not a finite odd integer, then Java Math.pow will return the result is Positive Zero. the Base value is negative infinity and the Exponent value is negative finite odd integer, then the result is Negative Zero. Base value is negative infinity and the Exponent value is greater than zero but not a finite odd integer, then the result is Positive Infinity. the Base value is negative infinity and the Exponent value is positive finite odd integer, then Java Math.pow will return the result is Negative Infinity. and, if the Exponent value is finite and not an integer. Then Java Math.pow will return the result is NaN. The Java Math.pow function is used to return the Power of the given number. First, We declared variable a of type Double. Next, we used the Java Math.pow function directly on expression. Here, we used System.out.println statement to print the result as output. Next, We used the Math.pow Java with one positive double value and other argument as zero. Here, We used the Java Math.pow Function directly on Positive double values. Next, We used the Math.pow Java Function directly on Negative double values.